Judge – Don Schiewer, Jr.
About ten or eleven years ago (has it really been that long?) G_d began to open my eyes to the atrocity which is the status quo evangelical mindset about G_d, Justice, Mercy, Compassion, Generosity, Love (the list goes on) – my world was turned upside down and all that I thought I knew and believed to be true about my faith was shaken (not lost – but seriously disturbed). I became engaged with the Text like I’d never experienced before…the words lept off of the pages; my very bones began to burst with this “new” (I don’t believe it to be new to the world – but it was definitely new to me) way of being – a new way of being in the presence of G_d! Many of the people around me worried that what I was talking about and learning was ‘dangerous’ or ‘heretical’ but like a moth to a flame I could not turn away from it…G_d was drawling me into a place that I never knew was available to me – a place of intimacy – where brokenness is not something to be feared but something to be redeemed – where failure was propped up by a G_d who loves perseverance – where love was given without any thought of repayment – where generosity flowed from the mouth that spoke of Justice and Mercy. A place eerily comforting but all too often lonely because nobody believes that a place like that could truly exist…and even if it did – it was otherworldly and had no place here and now! My soul shudders at the thought that most people still feel this way. Living in suspicion of anything that may even resemble such a place – it is too good to be true (or too good to be ‘good’ – there must be something that we aren’t seeing). G_d began to speak to me through His Word about a way to live that was fulfilling and closer to the image in which we were created. He drew me to places that my good ‘Christian’ upbringing taught me to reject – the Hebrew Text! 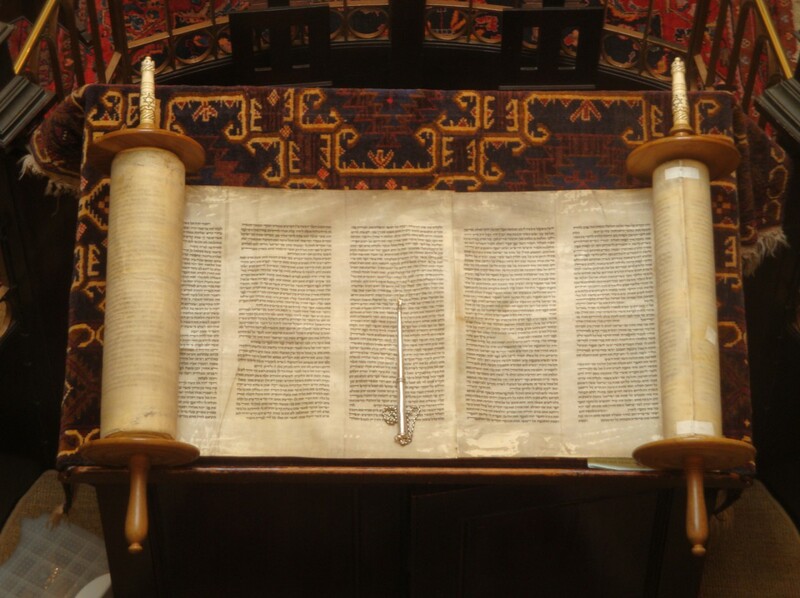 The Torah – the Law which was given to G_d’s people whom He had rescued from oppression and was trying to teach how to become a free people…no longer shackled and bound but instead expressing the fullness of life that the Creator of all things had intended. This is where I was drawn – I found myself unable to sit still while exploring the vastness of those G_d breathed Laws – I was pulled into the freedom that these gave (even generously). They were not the legalistic/constricting things that I was taught to understand them to be. Instead they were about treating others justly regardless of their place in society – being generous with those things that G_d entrusted to us – and to not judge others worthiness to receive what was G_d’s to give. This G_d (that I had professed for most of my life) was so different than what I was taught – He didn’t just talk in platitudes – but with expectation that His people – His children – His bride – His beloved would sprint to this way of being and participating (actively) in the Kingdom in which He was giving us residence. I looked around and quickly realized that although most of the people that considered themselves to be my neighbors in this Kingdom agreed with the expectations put forth – there was little in the way of movement to be seen. Why is this? What is the disconnect? Why aren’t we moving? – Why did I never see this before? How was I so blind to what I (we) should be about – we should be about our Father’s work – so what was stopping me (us)? I began to understand The Fall very differently. It was not about disobedience as much as it was about our desire to be Judge (to know the difference between Good and Evil) we coveted this power that G_d possessed but was wise enough not to give us inherently. G_d knew that our ideas of Justice and Mercy (which are ultimately the job of a judge) were distorted and fell short of His. G_d in His mercy threw us out of the Garden in order that we would not eat from the tree of life and live forever as (lousy) judges…in order that someday He would retake that place, He would return as Judge and set all things right! All of the Text is G_d breathed with that as the backdrop – the return of the rightful Judge. I noticed that throughout my experience in the church that we still very much liked being the judge – we would often withhold mercy from people because we judged them to be undeserving of mercy (and oftentimes deserving of punishment/isolation/condemnation/rejection) and we did this while proclaiming that this is what G_d wants. We ignored the poor – after all they made their bed now they have to lay in it! We dismissed the addicted – you reap what you sow! We pretended to not see the suffering – if they had more faith they wouldn’t suffer! G_d broke my heart! This is not what He had in mind for His creation – we had stolen from Him the beauty that He had intended! Worse – we perpetuated much of it and declared it was being done on His behalf! I repent – I was a part of this parade of ignorance and pride! The Word declared a different way of being than this…I could not escape the gravity with which it pulled me. Leave the corners of your field – give open handed to the poor – honor your father and mother – take care of the widows – don’t bring an harvest offering to the LORD without giving first to the poor. Texts that wouldn’t allow leaders to ‘count’ the people and therefore reduce them to a number…census’s that collected half a penny so that no one could think higher of himself than his neighbor. G_d was about equality – G_d was about compassion to the poor – G_d was in love with His creation! G_d was so in love with His creation that He stepped into our suffering. He showed us a way of being that was life-giving and beautiful – He showed us how He had intended for us to live – 2,000 years later we still celebrate that life. Yet we seemingly have little interest in intentionally emulating it. That way of life taught us many important things that we’ve chosen to ignore – generosity, justice, mercy, and love for those that we’ve believed were undeserving! We were taught through that life that we are to be about the giving and risking not about the hording and protecting. That we are to give without expectation of return, that we are to give without qualifying, that we are to give without regret! If we were to live that way – the Kingdom of G_d could be realized now, even right now! But how? Who would listen to such non-sense – we’ve been taught for so long about stewardship and protecting G_d’s precious resources – and I just want to give them all away? But – it gets worse…not only do I want to give away G_d’s resources – I believe the church needs to live beyond it’s current resources…live out into the unknown (think about the parable of the Talents – risking everything was rewarded…burying what was had was condemned)! How do you start changing the world with no money, no platform, no credibility? You just start – at least that is what I believe G_d is saying to us! I wasn’t going to change the world until I just started! But I fear unless we remember where we came from we will not know where we are going – or worse we will wrestle away from G_d what we should be giving back to Him – His place as Judge (of resources, of people, of what is good and evil). G_d is amazing in that He was willing to give everything away – His creation – His son (His own life if you will) – and even His way of being…He desires to use us to be a part of the redemptive process of His world – for His purposes – and I desire nothing more than to be a part of that. Today we the church stands at a cross-road: One of sound choices and reasoned action that will secure us for a time to come and the other of dangerous and audacious faith that G_d may be calling us to change the world! The second choice is the theology on which the Text is based and how it has played out until now – shall we continue on or have we lost nerve that we could continue in this audacity? G_d told Abraham that He would bless him in order that he could be a blessing to others – not so that he could protect the blessing out of fear that he might lose it if he was not careful. G_d has blessed what we’ve done so far – what will we do with that blessing? Protect it or give it away? Let us go now and seize the land which G_d has promised to our Fathers -or- the land is filled with giants and fortified cities we will die if we go in. I tell you friends – today we stand at the edge of that promise and G_d is waiting to hear our decision. What does it look like when we ‘take up our cross’ in the same manner that Jesus did? As we enter the Last Week (Holy Week) may we ponder what this may mean to how we live in, and amongst, our fellow sojourners. I believe the Text proposes the concept that our interaction with others is based in whether or not we sin…consider; those who did not clothe the naked had sinned –> Why? What was their sin? I want to assert that sin is the taking of the role of judge from the one True Judge – we, when we ate from the Tree of Knowledge, gained (maybe even stole) the role of Judge of Creation from G_d (Hence the Text declaring that we’d become more like Him)…He has spent the rest of history preparing to return as The Judge. We can see that return in this section of the Text. The sin therefore in this section is that of poor judging – we didn’t perceive that we even needed to help – our judgment was off. It is the same as our ‘first’ sin – we judged that being naked was bad! We had always been naked – G_d even judged it to be very good. Therefore – I would like to set before you the notion that the role of sin in humanity is that of an unjust judge (us) ruling over the creation of a Just Judge and G_d desperately wants us to return that role to Him!